Get pointers on the chained tasks you must complete to unlock the Zk-383 submachinegun and Modele 1944 semi-automatic rifle. Chapter 2: Lightning Strikes has now begun as Tides of War, the Battlefield™ V live service journey, keeps evolving the battlefield. With Chapter 2 comes a new Chapter Event called A Few Good Soldiers, active between January 17 and January 30. A Few Good Soldiers has two Weekly Challenges. A Weekly Challenge is a multi-route of tasks where you choose the way as the roads fork. Reaching and completing the end task equals truly special rewards, like a new weapon or a stunning piece of clothing for your Battlefield V soldier. On top of this, each finished task earns you Chapter XP, which helps your Chapter Rank climb, earning even more rewards. More on progression in Chapter 2 can be found in our article on the subject. The first Weekly Challenge is themed around the added Squad Conquest game mode, available for a limited time on the Rotterdam, Arras, and Hamada maps. Squad Conquest is an 8-vs-8 mode where two pairs of opposing squads compete against each other to capture and hold all flags until one team runs out of respawn tickets. We’ll go through these tasks, one by one, and provide pointers. Your reward for completing the final task? A sweet addition to your arsenal: the Zk-383 submachinegun for the Medic class. Squad Conquest: Play three rounds of Squad Conquest. To warm up, your first task is to jump into Squad Conquest and complete three rounds. If you deploy on a different map for each match, you’ll get a good grasp of the vistas Squad Contest offers: Rotterdam, Hamada, and Arras. When completed, the Weekly Challenge tree branches off, and you can start tracking progress in two new tasks: Squad Spawn and Tag Team. Squad Spawn: Have five squad members spawn on you. When your squad members have died and are choosing a spawn point on the deploy screen, they are likely to choose a green dot representing a buddy from the squad. To complete this task, and to earn some extra XP, you’ll want to be that buddy. Stay alive and stay in strategic hot spots that your friends would want to be in, too. Tag Team: Kill or assist kill 20 enemies with your squad mates. If you and your squad buddies tend to engage the same enemies, you’ll notice that you often rack up both kills and kill assists. It’s all good; they both generate points and progress in this task. Stay close to your squad and cover each other’s backs to complete this one faster. Earning Trust: Score 15,000 in Squad Conquest. Everything you do on the battlefield (hitting enemies, damaging vehicles, spawning on squad members, etc.) earns you score. However, playing the objective is a sure way to pick up a big extra chunk. In Squad Conquest, playing the objective means controlling flags on the map. Also, make sure to follow orders from your squad leader – or issue them yourself if you’re the boss. Look at which flag has a flashing icon, go capture or defend it, and points will rain upon thee. Defend or Perish: Kill ten enemies in defensive objective areas. 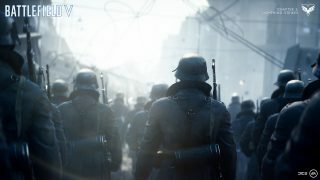 Capturing flags is a natural thing to attempt in Battlefield V, and you’ll often see players rushing towards the next control point, leaving captured areas behind. However, defending your hard-earned areas of the map is just as important. Learn where enemies usually attack from and get familiar with your control point’s hiding places and Supply Stations to gain an advantage. Send 10 enemies back to the deploy screen while defending, and this one’s in the bag. Foresight: Build 15 Fortifications in defensive objective areas. On the subject of defending, Fortifications are a great way to maintain ownership of your flags and to reshape a shattered battlefield. Hit the Toolbox button, look for silhouettes with a hammer icon, and start constructing sandbag walls, wooden barricades, tank traps, supply stations, and stationary weapons, and this will be done in no time. On Your Feet: Revive ten squad mates. Your penultimate task before getting your hands on the Zk-383 submachinegun challenges you to bring back 10 squad mates to life. 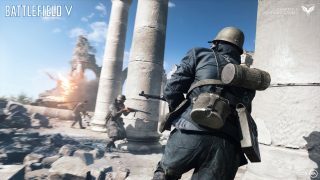 Thanks to Battlefield V’s buddy revive system, any class can attempt this – but revives of Assault, Support, and Recon players are slower. Deploy as a Medic if you want speedier revives. Sanitäter Sonny Tater: Revive six teammates in one life as a Medic. Speaking of Medics, this (optional) task lets you deploy as the Syringe-wielding class and take on a true pulse-raiser of a challenge: do six revives in one life. This requires a balanced blend of seeking out action and avoiding its dangers. Look for the revive icons above the bodies of fallen teammates to locate potential revives, but keep in mind that there’s a reason they died in that spot – you may be next. Lay down smoke with your Smoke Grenade Launcher for safer revives, keep an eye on your health, and bring another Medic if you should need a revive yourself. Winning: Win a round of Squad Conquest. The final task requires you to emerge victorious after a completed match of Squad Conquest. This requires the two squads of your team to perform, but that doesn’t mean you can’t shape the outcome. Simply put: play the objective, help and be helped, think a step ahead, and victory – along with a shiny new Zk-383 – will be yours. Continuing the squad theme, the second Weekly Challenge has two basic routes towards the final task, which will earn you a Modele 1944 semi-automatic rifle for the Assault class when completed. One route is likely to be completed simply by playing the game long enough, and the other is designed for challenge seekers, focusing on skill. Choose your route and remember that you’re never tied to a choice – you can always go back and attempt other tasks. Again, to warm up and to earn some Chapter XP, the challenge tree kicks off with a task where you simply need to play three rounds of Battlefield V’s new game mode. Seize this opportunity to learn the Squad Conquest map layouts and get a feel for the flow of a match. Widow Cleaner: Wipe out an enemy squad. This side task won’t bring you closer to the final goal, but the smug feeling you get for completing it is reward enough. Squad Wipes are achieved by killing the last surviving member of an enemy squad before his or her squad mates redeploy. This requires some good timing regarding enemy squad status, but we recommend trying this in smaller modes like Team Deathmatch or modes with centered action, such as Frontlines. Deploying on smaller maps where bottlenecks are plentiful, like Fjell 652, is also a good idea. Death Dealer: Kill 15 enemies in objective areas. This one requires you to be right in the thick of it, whether it’s near one of your flags or the flags of your enemies. Build Fortifications if you’re defending to get a tactical place to fire from or – in particular if the enemy controls the center flag – try flanking to land some unexpected shots. Untouchable: Kill two enemies without taking any damage. Time for some trickier tasks. Scoring two kills unharmed can be done in various ways. If you’re good with sniper rifles, try deploying as Recon and find a strategic place from which to land headshots – such as high up near the ruins flag on Arras. To confuse enemies, lay down the Sniper Decoy gadget which may make them aim at a dummy instead of you. You could also attempt a more explosive strategy and go for a multi-kill. Throw some dynamite or lay down mines for enemy vehicles with several seats. Scorer: Earn 5,000 score in Squad Conquest. Simply playing Squad Conquest – getting kills, capturing objectives, and all that jazz – rewards you with score. Not only does this feed your general and Chapter 2 rank progression, it works towards completing the task we’ve named Scorer. You could grind this one out but complete it fast and with flair by capturing flags and supporting your squad with ammo, revives, and deploys. Steady Aim: Kill eight enemies with headshots in one round. Obviously, the Recon class is a wise choice for this task. Its powerful, often scope-equipped rifles enable accurate marksmanship from long distances. Try to find locations that are either on high ground or at the edge of the map, overlooking action-packed areas. Spend your bullets efficiently and remember to hold your breath when aiming to remain steady. Max Capture: Capture eight objectives. To capture an objective point, more teammates must be in the objective area than the opposing team. Once this is met, the objective will begin to turn to your team’s ownership. Do this eightfold and you’ll receive Chapter XP and ascension to the final trial. Life Capture: Capture two objectives in one life. Capturing objectives is a team effort. Bring your squad – and preferably the other one in your team – and perform a coordinated capture of an enemy flag. Not only will you survive longer with friends close by, capturing flags actually goes faster the more players are close to it. Don’t forget to apply your Medical Pouch when needed! Deployed: Call in ten Supply Cannisters as a squad. Packed with ammo and health, the Supply Cannister is one of several helpful Reinforcements in Battlefield V. Squad Leaders can call this in when the squad has generated enough Requisition Points through general squad play (with a cost of 2,450 Requisition Points, the Supply Cannister is the cheapest Reinforcement). You don’t have to be the Squad Leader to track progress in this task – being in the squad that calls in the cannisters is enough – but it comes with the power of choosing the Reinforcement. Hit the Reinforcement button, choose Supply Cannister, and use the binoculars to pick a good landing spot for it. The Modele 1944 will soon be yours. Good luck! We’re confident that your Battlefield V skills will help you complete the Weekly Challenges of A Few Good Soldiers – and beyond. If you want more info on Chapter 2 challenges and rewards, head to our article on Chapter 2 progression. *Enter mankind’s greatest conflict now with the Battlefield™ V Deluxe Edition or Standard Edition on Xbox One, PlayStation®4, and PC. Play the full game with Origin Access Premier or try it first for 10 hours with EA Access or Origin Access Basic*.